The mandarin duck is a perching duck species found in East Asia. It is medium-sized, at 41–49 cm (16–19 in) long with a 65–75 cm (26–30 in) wingspan. It is closely related to the North American wood duck. 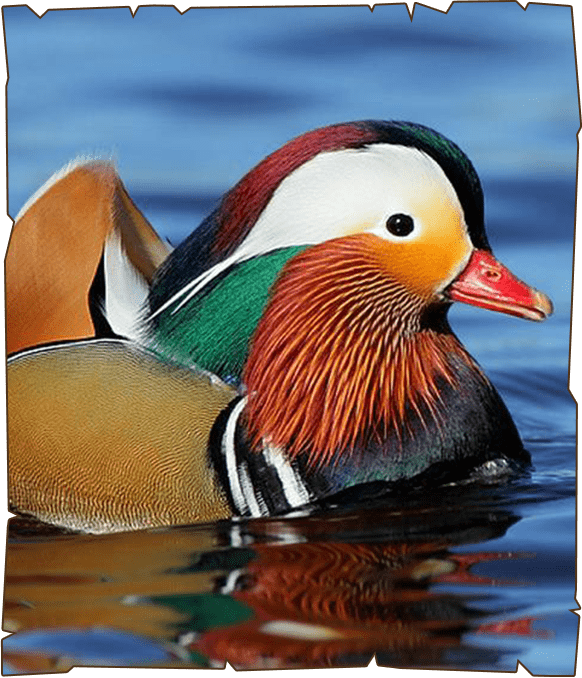 In the wild, mandarin ducks breed in densely wooded areas near shallow lakes, marshes or ponds. They nest in cavities in trees close to water and during the spring, the females lay their eggs in the tree`s cavity after mating. Mandarins feed by dabbling or walking on land. While it prefers freshwater, it may also be seen wintering in coastal lagoons and estuaries. They mainly eat plants and seeds, especially beech mast. The species will also add snails, insects and small fish to its diet. The diet of mandarin ducks changes seasonally; in the fall and winter, they mostly eat xacorns and grains.